Patko, A., Flanagan, A., & Thornton, K. (2018). ‘Learners about Learning’ student conference review. Studies in Self-Access Learning Journal, 9(4), 444-447. ‘Learners about Learning’ student conference was held on 7th September, 2018 at the Independent Learning Association Conference 2018 (ILA 2018), at Konan Women`s University, Kobe. Twenty-two high school and university students gave poster presentations related to their foreign language learning strategies, motivation and experiences. The event was divided into several sections starting from lunch, then ice-breaking activities, three rounds of presentations and discussion, and a final report to the main conference. Smiling faces and lively discussions proved the success of the event. 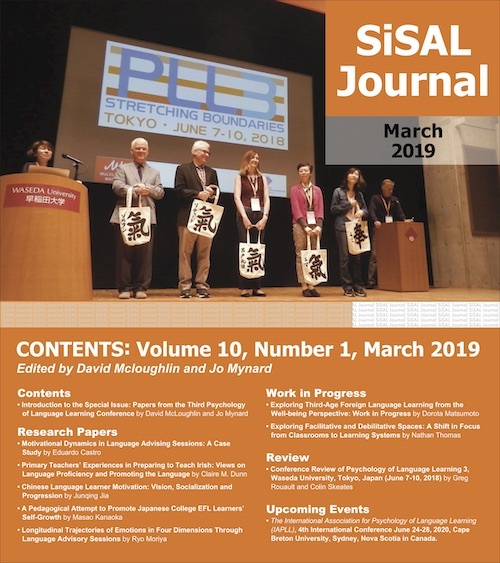 The idea to organize a student event at The Independent Learning Association (ILA) conference in 2018 came from the Kansai members of JALT’s Learner Development Special Interest Group (LD SIG) and the ILA organizing committee. The Kansai LD group had previously organized two student conferences entitled Kansai to the World (K2W). It provided the opportunity to participants to present and discuss their ideas, come up with solutions to problems and issues related to globalization with students from other universities and foreign exchange students. Both conferences were a huge success as participants felt the informal atmosphere eased the discussions and they could learn a lot from each other while using English as the means of communication (see Aden et al., 2017). Therefore, this was the conference style we aimed for at ILA 2018 as well. While the previous conferences had focused on global issues, the theme of ‘Learners about Learning’ was chosen for the ILA conference in order to better fit the conference themes of independent learning, autonomy, voices and agency. Once the theme was agreed on, we sent out the call for presentations to high schools and universities. Students were asked to submit an English abstract, and make a poster for their presentation. We had 19 applications, and on the day, 22 students from six schools (two high schools and four universities) joined the conference. On the day of the conference, participants gathered around noon to have lunch together. 22 presenters arrived. They naturally started to mingle already at this point, which oiled the path to a smooth conference. After lunch, we did a few “find someone who…” ice-breaking activities, then continued with a gallery walk when participants could walk around and check all the posters and write comments or questions about the topic. The first round of presentations followed this. All in all, there were seven individual presentations by high school students and ten individual or group presentations by university students. Presentations were divided into three groups according to topics. People in the same group presented simultaneously. Each round of presentations was 20 minutes followed by a discussion activity in small groups and a short break. All the posters were put on display and each presenter received post-it notes. They all walked around to read each other’s posters, wrote questions or comments and posted them on the poster. During the gallery walk, an atmosphere of concentration and intense focus descended on the room, which was inspiring for the organisers to see, and students engaged silently without interruption with the poster topics in their own time. This time was extremely valuable for generating meaningful discussion in the following rounds of presentations. Presenters were Yui Sago (Kobe City University of Foreign Studies); Yuki Azuma (Ritsumeikan High School); Yu Tsuchisaka (Ritsumeikan High School); Yui Fukushima, Yuka Sakuma, Itsuki Matsumoto, and Yukine Miyata (Konan Women’s University). Topics included learning strategies, attitude to learning, turning negative learning experiences into positive feelings, problems with the Japanese education system, and study abroad experiences. Presenters were Shouta Susaki, Yui Kinomoto, Eriko Kikuoka, Kento Miyoshi (Clark Memorial International High School); Mae Endo, Rica Chin (Gifu Shotoku Gakuen University); and Yukino Watanabe (Konan Women’s University). Topics included learning strategies, such as reading graded readers, listening to English songs, and time management tips. Presenters were Momoko Ikeda, Akiko Teramoto (Kobe City University of Foreign Studies); Aozora Miyanaga, Rina Hirai (Konan Women’s University); Shizuka Seko (Ritsumeikan High School); Kento Kuroda and Ryota Inui (Otemon Gakuin University). Topics were centered on motivation triggered by projects and events, such as a marketing competition, Model United Nations event, and intercultural communication. As the student event was happening parallel to the main conference, we were aware of the fact that many conference delegates would instead be attending presentations at the main conference. However, we were given almost an hour after the event to report back to the main conference. We asked presenters in advance to prepare a one-minute summary of their main ideas, which they would present in front of all the conference attendants. Although the huge auditorium had a supportive atmosphere, students were terribly nervous. Most of them were not used to speaking in front of such a large audience, but their preparation paid off. They all did a great job summarizing their thoughts in English. After everyone had finished, we used the rest of the time to hand out a certificate to each presenter and take a group photo. This was where we had planned to close the event; however, so many of the main conference attendants expressed an interest in the student presentations that the decision was made to return to the presentation room and showcase the posters to a wider group of conference delegates. Now, relieved that the event was officially over, students felt at ease presenting their posters and discussing their topics again, this time with conference delegates. The ‘Learners about Learning’ student conference was a great success due to the positive, open-minded attitude and thorough preparation of the students and the help of their teachers. Topics were diverse and interesting to all. The conference gave students the opportunity to interact and share their ideas in English with both people of their own age or near-peers, and teachers and professors from Japan and elsewhere. We hope that this positive experience inspires them to keep up their English learning, and to research their topics further. Finally, we would like to express our gratitude to the ILA 2018 organising committee and all the attendants of the main conference for their great support. Agnes Patko is an Assistant Professor and learning advisor at Kyoto University of Foreign Studies, Japan. She has an MA in TESOL and Japanese language teaching. Her research interests include learner development issues, self-access and self-directed learning, and Tandem learning. Ann Flanagan has been teaching at Ritsumeikan Junior and Senior High School for the past 20 years. She has an MA in TESOL from the School for International Training. Her research interests include extensive reading, teacher training, learner development and curriculum development.